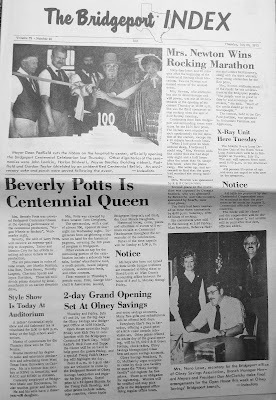 I mentioned in Random Thoughts that Bridgeport celebrated its 150 anniversary in the 1970s. A couple of people corrected me, said it was 100, and one even sent the above image. That's pretty strong evidence. But another guy said no -- that it was the 150th of at least something because he remembers the name sesquicentennial. I distinctly remember that name as being part of the celebration, too. And it couldn't be for Texas since that didn't occur until 1986. Edit: This may be the best explanation . . .